Cleans and protects vinyl in one easy step! All-in-one formula cleans vinyl easily. Unique gel formula makes vinyl care easy. Regular use keeps vinyl soft and supple. Keep your boat's vinyl seats, cover, and bimini looking good with 3M Marine Vinyl Cleaner, Conditioner & Protector. This all-in-one formula cleans and conditions vinyl while adding a layer of durable protection. Marine vinyl will look and feel like new far longer with regular use of 3M Marine Vinyl Cleaner, Conditioner & Protector. Every surface of your boat, including vinyl, is susceptible to salt spray, sunlight, and environmental contaminants. 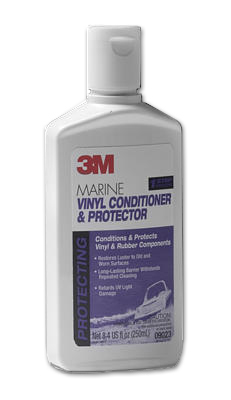 3M Marine Vinyl Cleaner, Conditioner & Protector keeps those surfaces clean and protected with a unique gel formula. The gel is easier to control as it's applied and a little goes a long way. That's good news if you have extensive vinyl seating, a vinyl boat cover, and vinyl bimini top. 3M Marine Vinyl Cleaner, Conditioner & Protector protects them all! Use 3M Marine Vinyl Cleaner, Conditioner & Protector inside the boat cabin, too. Interior vinyl may not be directly exposed to the elements but it will definitely benefit from the cleaning and conditioning action of 3M Marine Vinyl Cleaner, Conditioner & Protector. Apply 3M Marine Vinyl Cleaner, Conditioner & Protector using a foam or microfiber applicator onto dry vinyl. The vinyl will instantly look cleaner and have a softer texture. Over time, it will retain its appearance better than unprotected vinyl.